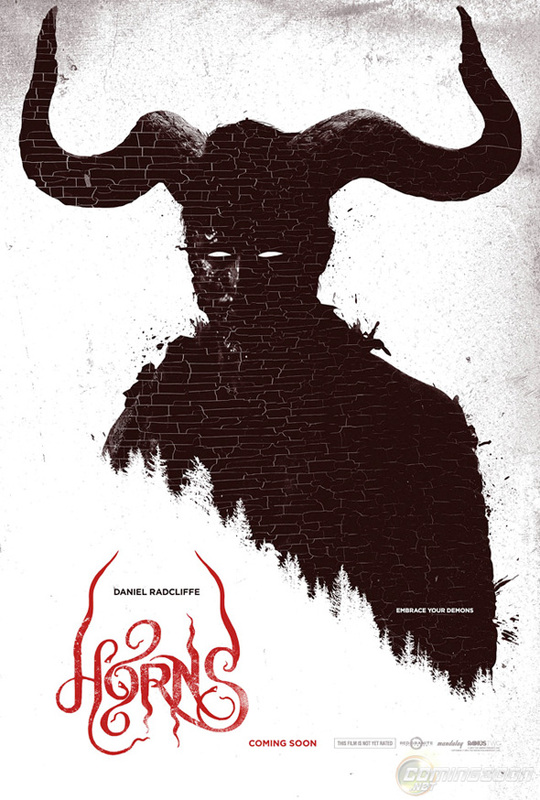 Following the release of the teaser trailer earlier this week, word comes from ComingSoon that Alexandre Aja's adaptation of Horns led by Harry Potter franchise star Daniel Radcliffe will hit theaters in the United States on October 31st. That was the same date for the film's debut in the United Kingdom, but it wasn't clear until now if that release would be the same here as well. Along with that news comes a cool new teaser poster, one that's much better than the newspaper headline teaser from across the pond. It doesn't even use Radcliffe's face this time, and it's more than a little ominous with that dark, horned figure. Hopefully we'll have more to say about the film after its Comic-Con panel next week in San Diego. Look! Update! If you haven't seen it already, catch the new trailer for Horns with Radcliffe online here. Slick. That is a great design. Kudos.